Is Ebates legit? That was one of the first questions I asked myself when I first heard about Ebates. I’m skeptical by nature, so a site that was offering to give me cash back for shopping online sounded too good to be true. I’m not a huge shopper, but I do like saving money shopping online (who doesn’t) so I decided to sign up and decide for myself if Ebates was a scam or not. That was back in 2011, and since then I’ve made almost $900 with Ebates. I think it’s fair to say that Ebates is legit. If you’re curious to learn more about Ebates, keep reading. I’m going to outline everything you need to know about Ebates. It’s easy to see why people think Ebates is a scam. I’ve told quite a few people about it and they’ve all had a similar reaction – but how does it work? How do they know what I buy? The concept behind Ebates is actually very simple. If you already know the retailer you want to shop at, you’ll simply go to “All Stores” in the top menu, and choose the store you want to shop at from the dropdown menu. 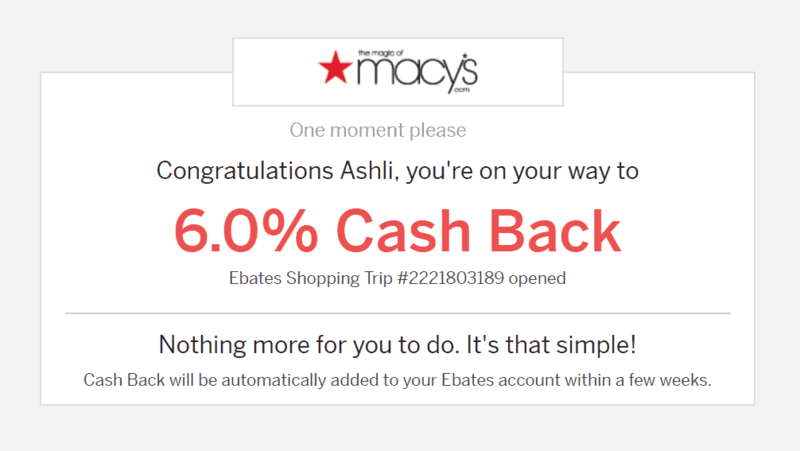 At the time of writing this article, Ebates is currently offering double cash back at Macy’s. This means I will get 6% of my shopping total in cash back (usually 3%.) For example, if I spend $250 at Macy’s, Ebates will give me $15 in cash back. Once you’ve navigated to the retailer you want to shop with, simply click the red “Shop Now” button. You’ll see a notification popup for a few seconds, then you’ll be taken directly to the Macy’s website. That’s it! You don’t have to do anything else. Just shop like normal and Ebates will take care of the rest. Your cash back will be added to your Ebates account a few weeks after your purchase. Now that you’ve seen how Ebates works, you’re might be wondering how Ebates makes money. Again, it’s actually very simple. Ebates are an affiliate for all of the retailers listed on the Ebates site. What that means is that when Ebates sends a customer to the retailer, the retailer gives Ebates a small commission payout. Ebates then passes a percentage of this commission back to you, the shopper. How Long Does it Take to Get Cashback From Ebates? Once you’ve made a purchase through Ebates, it takes a few weeks for the cash to appear in your account. You can choose to receive your payment via check or PayPal. Ebates will issue a payment if your cashback total is greater than $5. If it’s less than $5, don’t worry. You won’t forfeit your earnings, it will just roll over to the next payment date. Is Ebates Free to Use? Yes, it’s completely free to sign up for Ebates. You will never be charged anything. How Much Money Can You Make on Ebates? The amount of money you can make on Ebates is entirely dependent on the amount of online shopping you do. Of course, the more you shop online, the more money you can make. I don’t do a lot of online shopping, but I’ve made close to $900 since joining. If you’re a big online shopper then you could easily make a lot more. Sign up here to get a bonus $10. The #1 way to maximize your earnings with Ebates is to install the free browser extension. If you’re on the website of an Ebates partner store and you’ve forgotten to go to Ebates first, the browser extension will show a little notification that tells you how much cash you can get back with Ebates. Simply click on the notification button and your tracking link will be added. This is super convenient and it means you don’t even have to go to Ebates first. Check Ebates for coupons! If you’re a coupon fan, you’ll be happy to know that Ebates also offers exclusive coupons in addition to cashback. Invite your friends to Ebates. Ebates has a very generous referral program. Once you’ve become a free member of Ebates, you will get a referral link that you can share with your friends. When they sign up and make their first purchase, they’ll get a $10 gift card and you will receive $25 cash. Because I love Ebates so much, I’ve partnered with them for a giveaway. Ebates is going to give one lucky reader $100 cash. Simply fill out the entry form below for your chance to win $100.